Henry Lee: Born in China as the 11th of 13 children, Lee fled to Taiwan with his family at the end of the Chinese Civil War. He was a police captain in Taiwan by the age of 25. In 1972, Lee came to the United States to study Forensic Science. He also has a Ph.D. in biochemistry. Lee worked on the JonBenét Ramsey case, the O.J. Simpson Case and the Laci Peterson case. He also consulted on the murder of Deputy White House Counsel Vincent Foster, as well as worked on the D.C. sniper shootings. Lee was accused of accidentally destroying, or even hiding, evidence in the Phil Spector case. He is one of the most well forensic experts today. Cyril Wecht: Originally, Wecht wanted to be a musician. He was even concertmaster at the University of Pittsburgh. However, he went on to get his M.D. Wecht served in the Air Force, and later became a forensic pathologist. He eventually became coroner of Allegheny County in Pennsylvania. He served as coroner from 1970 to 1980, and from 1996 to 2006. He has personally performed more than 14,000 autopsies. Wecht is famous as a consultant, especially on TV. He has consulted on the outcomes of the deaths of John F. Kennedy (he is famous for disputing the findings of the Warren Commission), Sharon Tate, issues relating to the Branch Davidian incident, Anna Nicole Smith, JonBenét Ramsey and Vincent Foster. Wecht also has a pathology private practice, in which he and associates provide consultations on cases. However, he was tried for fraud, but it was declared a mistrial. Michael Baden: Baden’s high profile comes from the fact that he is seen everywhere, lending his insight as a medical doctor and forensic pathologist to a number of famous cases. He hosts the HBO show Autopsy, and also contributes on the Fox News Channel. He has written two non-fiction books that are quire popular. Baden served as the Chief Medical Examiner for New York City between 1978 and 1979. He has served as an expert witness or as a consulting pathologist on a number of famous forensic cases (some that require him to re-evaluate events of past history), including John F. Kennedy, Czar Nicholas II, O.J. Simpson, John Belushi, Phil Spector, Kathleen Savio and Lisa McPherson. Baden has a private practice as a pathology consultant. Clea Koff: Forensics has spawned a number of different sub-fields, and one of those is forensic anthropology. Clea Koff is one of the premier forensic anthropologists in the world, studying deaths in cases where the remains of a victim may be in advance stages of decomposition. Koff worked for the United Nations for several years, and helped on missions in Bosnia, Rwanda, Serbia, Coatia and Kosovo. Koff received her degree in forensic anthropology, and has written an autobiography about her work. Koff founded The Missing Persons Identification Resource Center, and works to help people identify their loved ones if they can’t find them through official missing persons channels. William Maples: This man was a noted forensic anthropologist working in the middle of the 20th century. He had a Ph.D., and authored a book (with Michael Broning), Dead Men Do Tell Tales: The Strange and Fascinating Cases of a Forensic Anthropoligist. He became well-known for consulting on cases of the deceased, by looking at their remains. He worked on the U.S. president Zachary Taylor, looks at the case of “The Elephant Man, John Merrick, Francisco Pizarra and the Ramanov family, of which Czar Nicholas II was the head. He worked at the Florida Museum of Natural History, and was known for helping to solve unsolved cases. Joseph Bell: This man pioneered some of the techniques known today in forensic pathology. At the time (in the late 19th century and early 20th century), forensic pathology was rarely used as a way to help solve crimes. Bell taught his students about observation, and built upon knowledge from his great-grandfather, the forensic surgeon Benjamin Bell. Bell is considered to be an inspiration for Sherlock Holmes, since Arthur Conan Doyle met him in 1877 and was impressed by him. Bell taught at the University of Edinburgh in the medical school, and served as Queen Victoria’s personal surgeon whenever she was in Scotland. He is still studied today by forensic pathologists learning techniques of diagnosis and understanding behavior. Edmond Locard: One of the pioneers in forensic science is Edmond Locard. He was well-known for the formulation of the basic tenet of forensic science: “Every contact leaves a trace.” Locard studied law and medicine at Lyons, and he also became the assistant to criminologist Alexandre Lacassagne. After leaving Lacassagne, Locard founded the first police laboratory, starting in the Lyons police department with two attic rooms and two assistants. Locard developed 12 matching points for fingerprint identification. He was known as the “Sherlock Holmes of France.” His work paved the way for forensic science to find a place in police work. Sara Bisel: One of the pioneers of forensic anthropology, Sara Bisel studied a number of interesting cases. She has a degree in biochemistry, as well as a degree in classical area studies. She was most interested in uncovering information about events from the far past. She played a prominent role in the research associated with Herculaneum, the town destroyed by the eruption of Mount Vesuvius. She was known for her professionalism, and taught at various schools. Her work, and her theories and processes, especially with regard to health and nutrition, is considered to have been a great help in advancing forensic anthropology, especially as it relates to understanding stomach contents and evaluating the health of a victim. William Bass: Another pioneer in forensic anthropology, William Bass was renowned for his ability to help identify human remains. 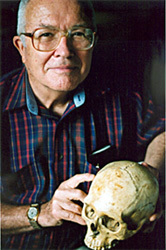 He founded the Forensic Anthropology Research Facility at the University of Tennessee. He was a professor there for many years. His facility is referred to as the “Body Farm“, a name popularized in a fictional book by Patricia Cornwell of the same name. Bass has written fictional stories as well, using the name Jefferson Bass, reflecting his collaboration with Jon Jefferson, who helped write a non-fiction book about the Body Farm. Students from all over come to study at the Body Farm, to learn about identification techniques. Alec Jeffreys: While not exactly a forensic expert himself, Sir Alec Jeffreys pioneered many of the techniques used in forensic science today. This British scientist is most well-known for his work with DNA profiling and DNA fingerprinting. His work is used in crime labs all over the world. He teaches genetics at the University of Leicester, and is know to help detective work, immigration disputes and help prove paternity. This entry was posted in Forensics, Science and tagged Clea Koff, Cyril Wecht, Forensic pathology, forensic science, Henry Lee, Michael Baden. Bookmark the permalink.